A few months ago, I decided to buy a NuWave PIC (precision induction cooktop). Primarily, I wanted it for it's convenience and portability. 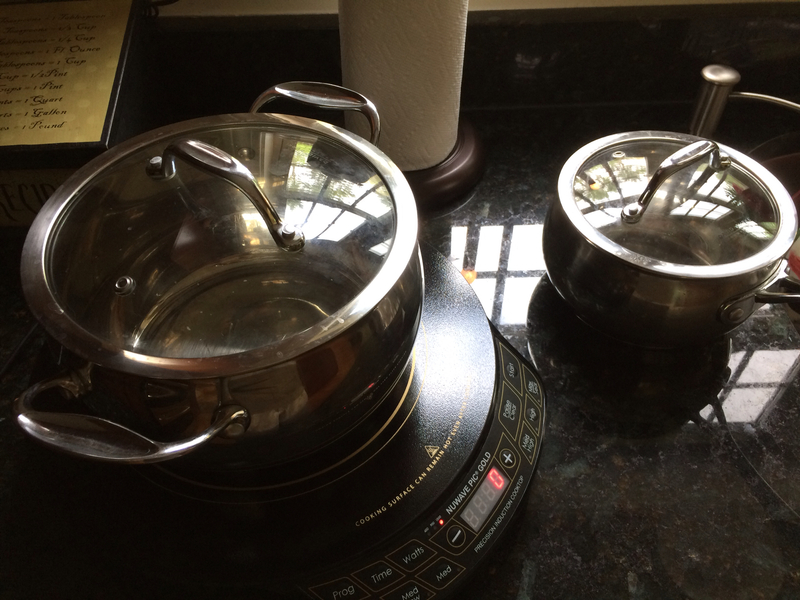 It came two frying pans, a 3.5 at stainless pan, strainer basket and lid and a second "burner." It was when I began using it, the features really began to make me smile. Cooking with it is a breeze since it has multiple wattage settings in addition to the pre-sets which range from "low" through "max sear". It is and does function, just as advertised. Low means immediately "low" and "Off" means off. It is great for melting chocolate and maintaining the creamy consistency needed for dipping strawberries too! It's me, so, of course, there's a story!! The first time I used it, I was boiling the chicken I give Moon and Copper. Couldn't figure out why the water/chicken wasn't doing anything. Telling the Pres that the thing was a dud, I took out the QRG (quick reference guide). It wasn't the dud. I was. I never hit the "START" button. I was waiting the other day for something to get done in the toaster oven. Unfortunately, I had never plugged it in! Yummy food and reflections! That's what I call the good life. If we only had countertop space in our apt galley kitchen . . . this cooktop would be a great way to prepare meals quickly. And, yes sometimes I have forgotten to turn something on or to plug it in!